(2) reaffirm and protect the primary authority of States to regulate alcoholic beverages. SEC. 3. SUPPORT FOR STATE ALCOHOL REGULATION. (a) Declaration of Policy—It is the policy of Congress that each State or territory shall continue to have the primary authority to regulate alcoholic beverages. (b) Construction of Congressional Silence—Silence on the part of Congress shall not be construed to impose any barrier under clause 3 of section 8 of article I of the Constitution (commonly referred to as the ‘Commerce Clause’) to the regulation by a State or territory of alcoholic beverages. However, State or territorial regulations may not facially discriminate, without justification, against out-of-state producers of alcoholic beverages in favor of in-state producers. (1) The State or territorial law shall be accorded a strong presumption of validity. (2) The party challenging the State or territorial law shall in all phases of any such legal action bear the burden of proving its invalidity by clear and convincing evidence. (3) Notwithstanding that the State or territorial law may burden interstate commerce or may be inconsistent with an Act of the Congress, the State law shall be upheld unless the party challenging the State or territorial law establishes by clear and convincing evidence that the law has no effect on the promotion of temperance, the establishment or maintenance of orderly alcoholic beverage markets, the collection of alcoholic beverage taxes, the structure of the state alcoholic beverage distribution system, or the restriction of access to alcoholic beverages by those under the legal drinking age.’. SEC. 4. AMENDMENT TO WILSON ACT. There we go. Do you feel more informed? Do you have a better sense of what all the hullaballoo is about? No? Hmm—I guess I will need to work a little harder. The proposed statute, as you can see, does not operate alone. Instead, it amends existing statutes. We now need to understand which statutes, and why. I’m going to take the two statutes it amends out of order. Section Four of HR 5034 amends the Wilson Act, which is actually the older of the two statutes amended. We need to look at the Wilson Act first, because the second, the Webb-Kenyon Act, was actually a subsequent fix to the Wilson act. Both statutes pre-date Prohibition. The shipment or transportation, in any manner or by any means whatsoever, of any spirituous, vinous, malted, fermented, or other intoxicating liquor of any kind, from one State, Territory, or District of the United States, or place noncontiguous to but subject to the jurisdiction thereof, into any other State, Territory, or District of the United States, or place noncontiguous to but subject to the jurisdiction thereof, which said spirituous, vinous, malted, fermented, or other intoxicating liquor is intended, by any person interested therein, to be received, possessed, sold, or in any manner used, either in the original package or otherwise, in violation of any law of such State, Territory, or District of the United States, or place noncontiguous to but subject to the jurisdiction thereof, is prohibited. Webb-Kenyon was the fix for the hole in the Wilson Act. Together, the two statutes say alcohol from another State is subject to all the same restrictions as alcohol from within the State, but all remain subject to the Commerce Clause, prohibiting one State from discriminating against alcohol from another. That lasted until January 16, 1919, when the 18th Amendment was ratified. 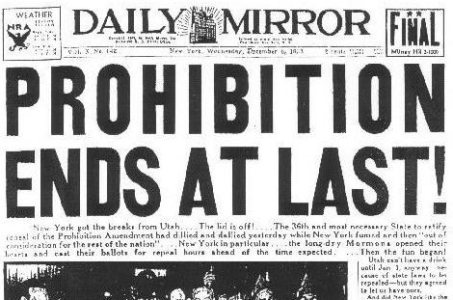 Prohibition was the law of the land, superseding both the Wilson Act and the Webb-Kenyon Act. How did the statutes and the Amendment interact? That is what the Court most recently determined, in 2005, in Granholm v. Heald. The States’ position is inconsistent with our precedents and with the Twenty-first Amendment’s history. Section 2 does not allow States to regulate the direct shipment of wine on terms that discriminate in favor of in-state producers. By its own terms, the Wilson Act did not allow States to discriminate against out-of-state liquor; rather, it allowed States to regulate imported liquor only “to the same extent and in the same manner” as domestic liquor. States were now empowered to forbid shipments of alcohol to consumers for personal use, provided that the States treated in-state and out-of-state liquor on the same terms [emphasis mine]. Now it becomes obvious that HR 5034 is a reaction to Granholm, and is specifically formulated to reverse the Court’s ruling based upon its reading of the Wilson Act and the Webb-Kenyon Act. Remember—those are the two statutes HR 5034 would amend. 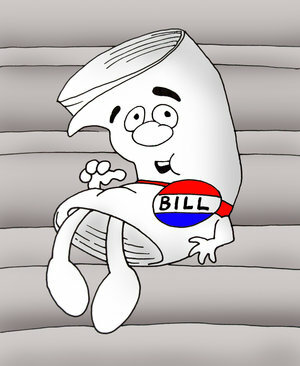 How would they look if HR 5034 were to pass? Do you see what it does? It takes away the anti-discrimination language. It directly addresses the Court’s observation that the Webb-Kenyon Act did not repeal the Wilson Act, which specifically prohibited discrimination against out of state liquor. (b) Construction of Congressional Silence—Silence on the part of Congress shall not be construed to impose any barrier under clause 3 of section 8 of article I of the Constitution (commonly referred to as the `Commerce Clause’) to the regulation by a State or territory of alcoholic beverages. However, State or territorial regulations may not facially discriminate, without justification, against out-of-state producers of alcoholic beverages in favor of in-state producers. (3) Notwithstanding that the State or territorial law may burden interstate commerce or may be inconsistent with an Act of the Congress, the State law shall be upheld unless the party challenging the State or territorial law establishes by clear and convincing evidence that the law has no effect on the promotion of temperance, the establishment or maintenance of orderly alcoholic beverage markets, the collection of alcoholic beverage taxes, the structure of the state alcoholic beverage distribution system, or the restriction of access to alcoholic beverages by those under the legal drinking age. Now this is where it gets interesting. Note first that HR 5034 removed the anti-discrimination language in the Wilson Act. Why wasn’t that enough? Why do they also need the changes to Webb-Kenyon? It’s because the Granholm case is not just about the statutory language; it is, ultimately, a case about the Constitution, the interplay between the Commerce Clause and the 21st Amendment. The Court did not say the laws of Michigan and New York were invalid because of the two statutes. Rather, it said they were invalid because they were unconstitutional. The analysis of the statutes was really an analysis of the 21st Amendment. The Court determined that the 21st Amendment put the interpretations of Wilson and Webb-Kenyon, as they existed at the time the Amendment was ratified, directly into the Constitution. Amending those statutes now would not do anything to alter the Court’s finding of the meaning of the Constitutional Amendment, which is interpreted as written. That is why HR 5034 does not merely take away the anti-discrimination language of the Wilson Act. In addition to removing the Wilson Act’s anti-discrimination language, HR 5034 also fiddles with the Webb-Kenyon Act. What it is really intended to do is not to amend Wilson, because that would have no effect all by itself. What it is really intended to do is shift the ground rules for the Supreme Court’s constitutional analysis of discriminatory laws, and to remove State regulation of alcohol from the Commerce Clause limitations. We need to break down those new ground rules one at a time. Let’s start out of order, going from easiest to hardest. The State or territorial law shall be accorded a strong presumption of validity. Statutes always come before the Court with a presumption of validity. This is of very little import. The party challenging the State or territorial law shall in all phases of any such legal action bear the burden of proving its invalidity by clear and convincing evidence. This is more interesting. When a State passes a statute that is discriminatory, once the plaintiff shows its discriminatory nature the State has the burden to show “that it advances a legitimate local purpose that cannot be adequately served by reasonable nondiscriminatory alternatives.” HR 5034 purports to shift that burden from the State to the person challenging the statute. But can it? The answer, simply stated, is probably not. The Constitution trumps a statute. The Court is very jealous of its authority to interpret the Constitution and is not required to bow to the dictates of Congress. That is why HR 5034 talks about “support” and “the policy of Congress.” Congress knows that what it proposes is beyond its power. It is doing two things. First, doing the bidding of the wholesalers to make them happy, and second, effectively filing a “friend of the Court” brief by way of statute, telling the Supreme Court how it would like the Court to rule. The Commerce Clause says Congress has the power “To regulate Commerce with foreign Nations, and among the several States, and with the Indian tribes.” But there’s also an implied corollary of the explicit language of the Commerce Clause, called simply “the dormant Commerce Clause.” It states that only Congress has the power to regulate commerce between the States, and unless it explicitly grants that power to the States, a State may not pass a regulation that improperly burdens or discriminates against interstate commerce. Hence, where Congress is silent on the power to regulate, the power is retained by Congress. The dormant Commerce Clause is the target of subsections (a) and (b). Subsection (a) grants authority to the States, and subsection (b) says ‘do not read the dormant Commerce Clause into any silence on any issue relating to alcohol, but instead look at subsection (a).’ Together, these two phrases are formulated to take the presumption that States may not regulate alcohol away, nullifying the dormant Commerce Clause. However, State or territorial regulations may not facially discriminate, without justification, against out-of-state producers of alcoholic beverages in favor of in-state producers. Many readers will recognize those as the different justifications given by alcohol wholesalers for their role in the three-tier system. They argue that States lose control over the alcohol market if just anybody can bring alcohol into the State and distribute it to consumers. What is in it for the wholesalers? Control. Simply stated, the wholesalers believe, and with good reason, that through their lobbying power in State legislatures, they can keep their monopolies in many States, prohibiting direct sales from wineries to consumers. They are less confident that they will prevail if the arguments are decided in courts. With this proposed statute, the wholesalers are swinging for the fences. Remember, Granholm considered a very limited question: whether States can have different rules for direct delivery of wine for foreign and domestic wineries. That is important because the only time wholesalers run into conflict in their lobbying efforts is when they run up against local wineries. 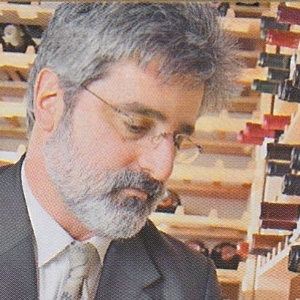 Those wineries have their own local lobbying power, as well as individual personal relationships with State legislators. 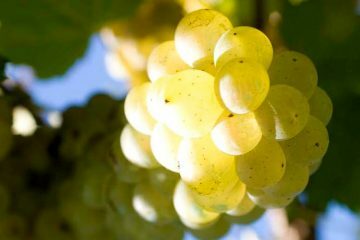 However, if the State can write a protectionist law that benefits both the local wineries and the wholesalers, absent a loud and well-funded outcry from individual consumers, they will have smooth sailing through local legislatures. Wineries know this is the purpose. They know that the idea of HR 5034 is to turn over the decision about who gets to buy which wine to the lobbyists for wholesalers, working in concert with an individual State’s domestic wine industry. If the bill passes, consumers will be limited to locally-produced wine, plus whatever the wholesalers choose to buy. Unfortunately, wholesalers tend to buy very large-production wines—the type they can buy by the pallet, rather than the case. Both the consumer and the small and mid-size wineries will suffer as a result. Whether HR 5034 will achieve its stated purpose is less certain, because the proposed statute is attempting to change the Court’s interpretation of the Constitution, a matter outside Congress’ power. The statute’s real effect would be in its power to persuade. The Court will still determine whether any limitations set by a State are so unreasonable that they violate the Commerce Clause. The Supreme Court is, after all, just nine people, and its rulings are not always Constitutional perfection—they’re simply whatever ruling can garner five or more votes. The Court has also made quite clear that it is willing to ignore its prior rulings if it wants to go in another direction. What does this mean for wine lovers? Do not rest comfortably in the above analysis that HR 5034 might not really overturn Granholm. 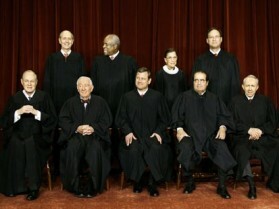 By the time a new case reaches the Supreme Court, the Court might find the “policy of Congress” persuasive. An interesting historical tidbit not everyone knows is that Justice Harry Blackmun, the author of the Court’s opinion in Roe v. Wade, was chief counsel for the Mayo Clinic before joining the Court. The opinion he authored, breaking down a Constitutional issue into medically-defined and easily identified trimesters, was almost certainly informed by his prior experience. So by the time a case based upon HR 5034 reached the Court, who knows who might be hearing it? It might even be somebody who will eat your children. Act now and let your voice be heard. You can contact your Congress-critter here. * Nothing herein is legal advice, merely analysis, and it is purely the opinion of the individual author. David Honig, the Publisher, looked at the thousands of quality wine blogs and realized there was a ready-made staff for the best wine magazine in the world. David has been running 2 Days per Bottle for two years now, and started up The 89 Project, focusing on that most unfortunate of scores, “89.” He is a self-educated oenophile, and defers to the tremendous experience and wisdom of the amazing staff at PALATE PRESS: The Online Wine Magazine. This post was mentioned on Twitter by palatepress: HR 5034: An Analysis – http://b2l.me/qrap4 What it is, how it came to be, and what it might meant should it pass…. Thanks for digesting this and making it easier for us who don’t speak congressional legalese. We all have a gut feeling on these types of things but it really helps when someone can explain it to us lay folk. You’ve done us all a great service by translating and delivering something we can all comprehend. RE: House Bill HR 5034: The Comprehensive Alcohol Regulatory Effectiveness Act of 2010. I am writing to urge you to oppose HR 5034. This is a piece of anti-consumer legislation. It only serves the wine wholesalers and wine distributors. It will not curtail abuse, reduce underage drinking or the social and financial cost stemming from those issues. But it will strengthen the wine distributor’s and wholesalers’ restrictive control over consumer choice. As a responsible wine lover, I want access to and choice in wines. HR 5034 will result in PERMANENTLY limiting my access to and choice of wine. Please, do not support HR 5034! What an excellent break down of the text! I will share it with all of our winery patrons! David: Thank you very much for the cogent and careful analysis of HR5034 and the effects of the statute, if passed. I tlaked to a Cannel Five reporter today, and i think he must have read it, because he had his facts very straight. Great Job! David…an excellent “Analysis”. What the average consumer may not be aware of is that the fate of 5000 to 6000 small family wineries hang in the balance (and maybe as many as 100,000 workers’ jobs). Many farmers (wine grape growers) fight many battles. Right now they are fighting an invasive grape moth from Europe that destroy crops in northern Caifornia. As I have read, many of the Oregon wineries (who have far fewer tourists visiting than CA wineries) may not be able to buy the glass to bottle next year’s vintage. The only thing keeping these operations alive are selling Direct-to-Consumers. If this bill should pass and the Supreme Court not challenge it we most certainly we see a significant loss of these small family wineries. Do the wholesalers care? Absolutely not…for all practical purposes the wholesalers have already abondoned these wineries over the past few years, not carrying their wines. It would free them from being bothered by the wineries or their brokers trying to get a foot in the door…it would simply the collective lives of the wholesalers. Does anyone really see a teenager buying a bottle of wine on the Internet and waiting up to 5 to 6 days over getting 24 cans of beer..give me a break. It is far more likely that a teenager gets fake ID and buys their beer at a local liquor store. Why isn’t anyone up in arms about this issue in the fights to get liquor into the mass merchandisers??? Do you honestly think that the clerks at these stores will be good at spotting fake ID? And as far as tax goes is there any evidence that the wineries are not paying that state tax? Anyone who spends any time reviewing the articles and discussions going on anywhere concerning the wine industry knows that compliance is a major issue that is not dealt with lightly. The individual state ABC (Alcohol Beverage Commissions) will shut down a winery in a heart beat if they are found not to be in compliance. What maybe is at the heart of this matter is that the wholesalers recognize that the American consumer is changing and in ways that may leave the local retailer (and the wholesaler) out in the cold. People now “expect” choice! Why should they be restrict to the same few thousand or so wines at the local store when the Internet can literally give them access to millions upon millions of choices (if you include wine that is not domestic) and many referrals from peers rather than a storeclerk trying to sell something they don’t know about. Politicans can very much be influenced by the heavy weight lobbyists for the wholesalers but there is one power that strikes more fear in a Congressman…and irate voter. There are approximately 76 million wine drinkers in America…and if this bill passes and the results are as you predict I think there will be a firestorm. In my humble opinion, these arrogant wholesalers may have opened a Pandora’s Box…if they thought that the three tier system was under attack before, they AIN’T seen nothing yet! You did everyone a service with your analysis. Question: if HR 5034 is a statute that effectively alters a Constitutional clause rather than merely altering a prior statute, couldn’t it be seen (and attacked in advance) as an attempt to amend the Constitution by circumventing the amendment process? Thanks for the even handed review of HR 5034, frankly speaking for those of us in the industry it is difficult not to panic. Really, so much is at stake, especially for someone like me whose entire business is based on shipping direct to consumers. It’s a major concern, but I’ve been heartened to see the massive response to stop this legislation before it makes it out of the committee phase.